"Hot, hearty and, yes, sloppy. This flavorful favorite is a meal in a bun. Serve it up and watch your family run to the dinner table." 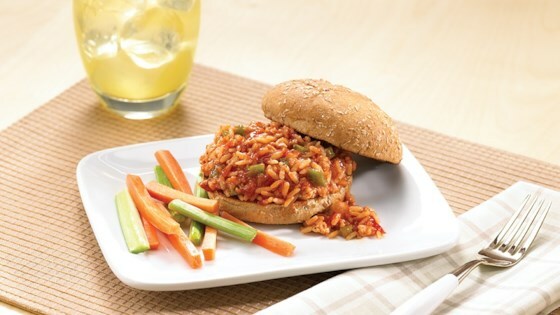 While the rice is cooking, begin making the sloppy joes. In a large skillet, heat oil over medium heat and add the chicken. Stir to separate the meat and then add the onions, peppers, garlic, salt and pepper. Continue cooking until the meat is cooked and the onions are translucent, about 5 minutes. In a measuring cup or small bowl, combine 1/4 cup water, ketchup, brown sugar, Worcestershire sauce, mustard and vinegar. Once the rice is cooked, drain and add to the skillet. Add the liquid ingredients into the meat and rice mixture and stir well to combine. Continue to simmer for about 5 minutes to meld the flavors.